Crossbow fire and Bolt Impact Sound Replace. This MOD allows you to change the sound effect of a bolt that was emitted from the crossbow. 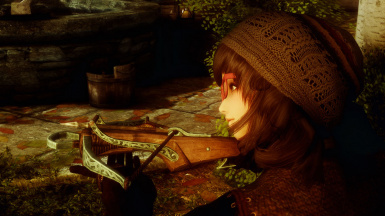 This MOD changes the sound of a crossbow coming up in Dawnguard. Dawnguard is necessary for use. The sound file varies according to an uploaded version each. Please use the sound file of an old version if dissatisfied with the latest sound. Changed "Shot and Reload" effect sound. Deleted "Imploved sound compatibility version" plugin file. New version allows you to change the sound when the bolt hits in all material. I change the sound effect of a bolt that hit the meat. If you have hit the meat, sound of Vanilla is played. This MOD can be installed in Wrye Bash or Nexus Mod Manager or Mod Organizer. If you want to install manually, please install the all files to your "Data" folder. This MOD uninstalls using tools as Nexus Mod Manager or Wrye Bash or Mod Organizer.